Blogging is important. I don’t know how many time I’ve said it, but I know I will probably keep saying it over and over again until I feel as though everyone has got the message. Why is blogging so important? Well there are a huge range of benefits, but the main benefit (I believe) is for your SEO. 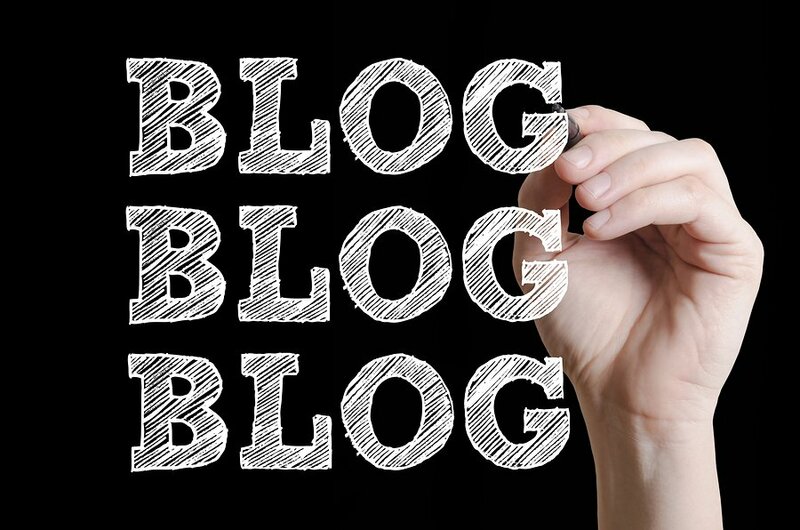 Yes, blogging does indeed benefit your SEO efforts. Think about it this way. One of Google’s most influential ranking factors in content. Google is obsessed with fresh, new content. How can you keep the content on your website fresh and new? It isn’t by changing what you say on your homepage, it is through a blog. 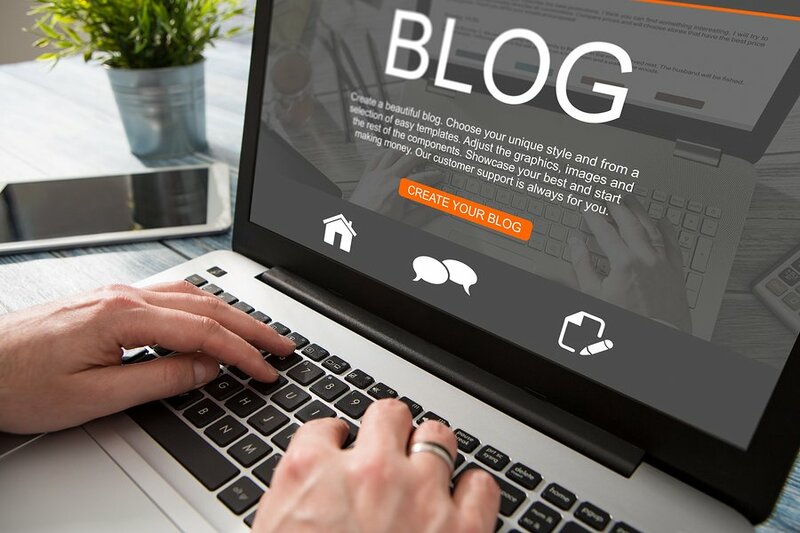 Your blog is important for your SEO! By updating your blog on a regular basis you are ensuring your website includes new and updated content that Google loves. By always posting new blogs, you are showing to Google that you care about users and you want them to have all the information they need. The problem I find most people have is the fact that they need to update their blog probably a couple of times a week. I mean, who has the time and dedication for that?! Well, if you want Google to take your website seriously, this is something you are just going to have to do. If you are seriously struggling for time, you are certainly one of many. 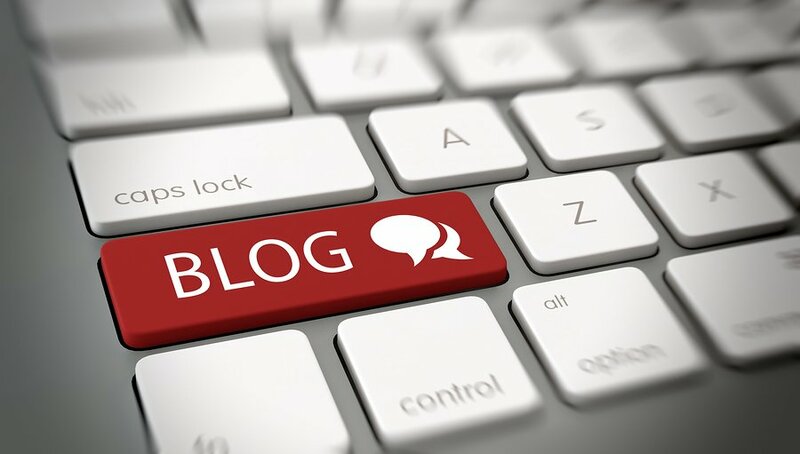 Time is a huge factor that limits our ability to write a constant flow of high quality blogs. However, I have written a previous blog giving you all the tips you could ever need to help you write your own blog in record time. There are no excuses now! 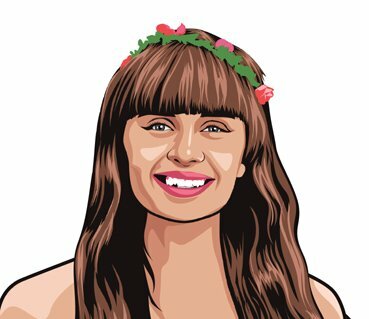 I write a blog every day. Sometimes I really struggle and it takes me almost half the day and other times it takes under 2 hours. The blogs I write (as you can probably see) aren’t small pieces either, they are 2, 000 words of pure hard work. Yes, writing that much everyday will tend to burn you out. But being in the game as long as I have, there are some tricks I have learnt along the way. You would be surprised at just how different my approach to writing blogs has changed over the years. When I ask, “what is the hardest thing about writing a blog?” Many of you would probably think about, the time it takes, or the research or the actual part where you have to write. And don’t get me wrong, they are all pretty hard parts about blog writing. But probably the hardest thing is coming up with an idea. Coming up with blog ideas can be tricky. Your blog will go absolutely no where if you don’t have a good enough idea. As well as this, if you decide to choose to write about a weak idea, your blog will also be weak. For some people, ideas do not come as naturally and they can end up wasting a stack of time trying just to think of an idea. 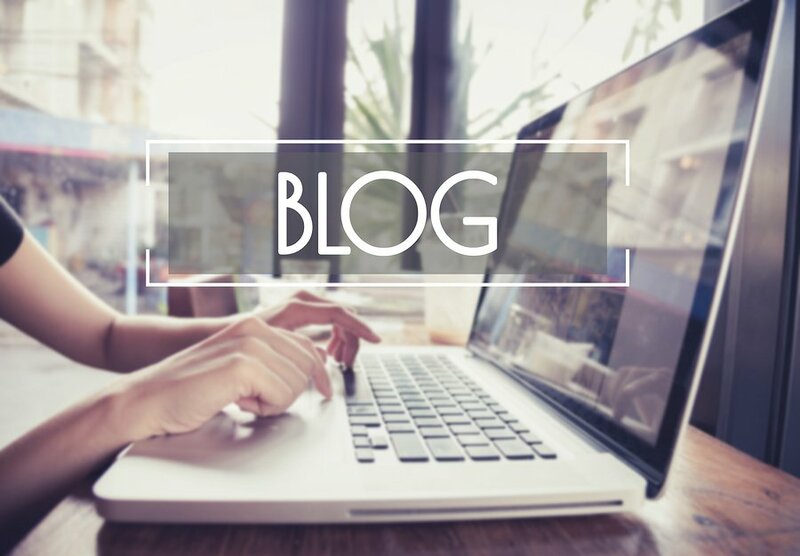 Taking into consideration that you should be writing multiple blogs per week and you can probably only write about your industry, you could be very limited in your ideas. If you are a candle business, for example, how many different ideas about candles can you think of before you run out? You may think that because I write a blog every day, I am scraping the bottom of the barrel to produce ideas that I can build on and write a quality piece of work. Well, you’d be wrong! I actually have ideas coming out of my ears. If you also want ideas coming out of your ears, then you have come to the right place! This blog will give you the best 4 tips to help keep your ideas flowing. After following these tips you are sure to never run out of ideas again! Bonus Quick Tip: Before we get into the full-blown tips, I wanted to give you a quick one. I know it sounds simple, but if you are ever out and about and an idea suddenly springs to mind, make sure you write it down. If not, there is a high chance you may forget it! I can’t tell you how many ideas and/ or titles for new blogs I have in the notes app on my phone! 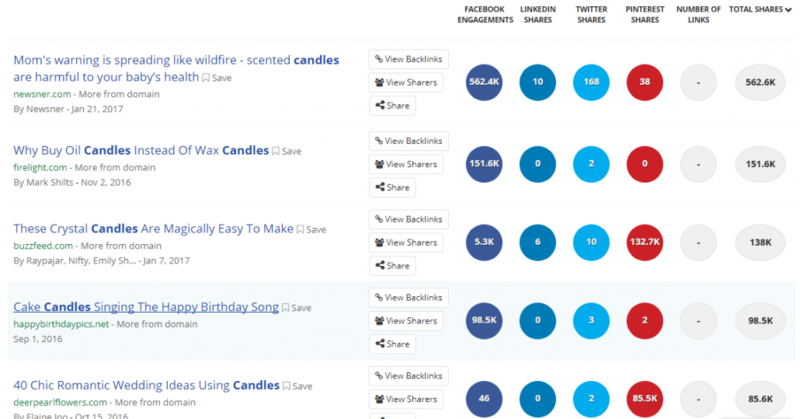 Use BuzzSumo to steal trending ideas. How can you steal treading ideas? By using BuzzSumo! I find this is probably the easiest way to help you come up with some new ideas. Personally, I visit BuzzSumo at least once a week and it helps me think of some killer new ideas. The best part of BuzzSumo (other than it is free!) is you know the ideas are popular, so you are potentially writing about a topic that a lot of other people want to read about. This could increase the number of people that visit your website and read your blog. You can clearly see what the top shared articles are. I’m not saying you should copy those ideas word for word. But surely one of the examples from BuzzSumo will get the juices flowing. You may even think of a new subcategory of ideas you have never thought about before. You can also fiddle around with the filters and change the date. So if you want to look at the most trending articles in the past day or for the past year, you can. You can even change the content type (for example, if you only want to see videos) and also filter based on word count (for example, you can exclude thin pieces of content). When it comes to producing ideas for highly trending topics, it is important that you focus more attention to creating headlines that are more shareable. Why do you need to focus so much effort on your headline? Well, when it comes to trending articles, almost 60% of people will share it without even reading the entire thing! The thing that will make people want to share your article? The headline! So when looking to go down the path of creating ideas that are highly trending, it is important for you to spend that extra bit of time thinking about your killer title. 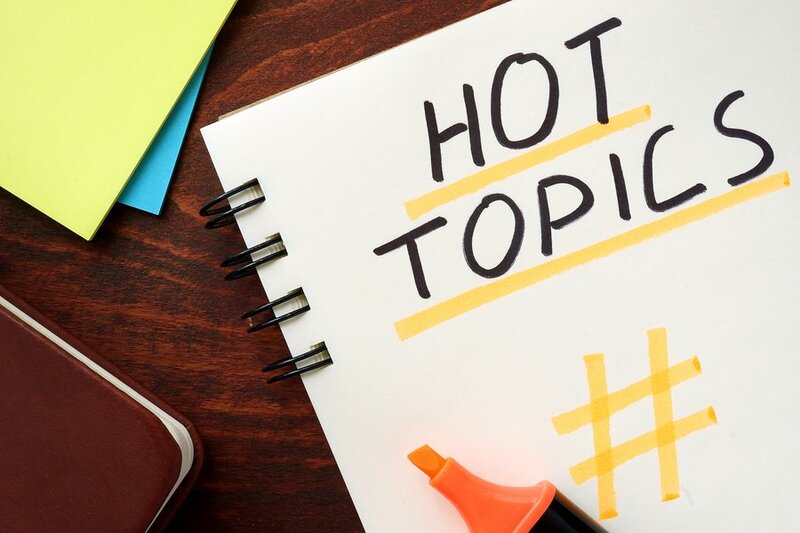 HubSpot’s Blog Topic Generator is a great tool to use. This sounds like an obvious one. There are a lot of different blog generators out there. Don’t waste your time going from generator to generator; I know you will love HubSpot’s Blog Topic Generator! HubSpot is probably one of the most popular blog topic generators and it is so easy to use. So if you find you are running low on ideas, this is a great place to visit. All you have to do is input a couple of nouns related to any topic you are thinking about writing. HubSpot will then produce 5 potential topics that you could write about. If you don’t like the topics that have been generated, you can try a different search. HubSpot gives you the title ideas and this will help you start to write the actual piece of content. Don’t forget that if there are a couple of ideas that you like from HubSpot, make sure you write them down for later use! Remember that these are just ideas and a lot of other people are probably using HubSpot and been shown the exact same titles. Therefore it is best you don’t copy the titles word for word. Make sure you add your own personal touch to the title to make it your own. Questions can be turned into pretty amazing blog ideas. Let’s face it, we all have questions about different things and we tend to turn to the trusty internet to ask these questions. This is good for you because you can turn the questions that people have about your industry into solid ideas. Quora is a place where people can ask questions. It is becoming very popular these days and it is a perfect place for you to find new ideas. You can pretty much turn a question from Quora straight around and make it your own topic. Take the question “what do people value most when buying candles?” This could be your own idea for blog. 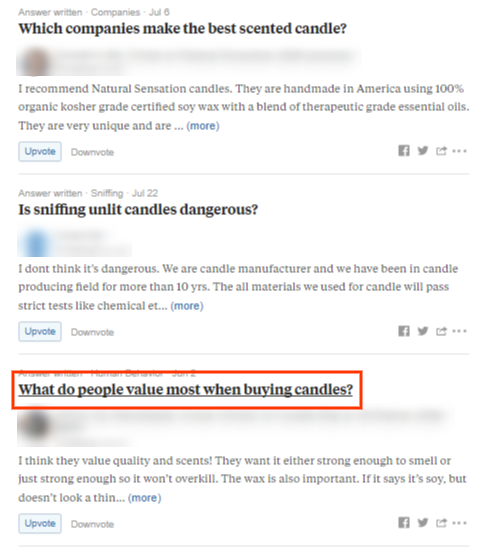 Your title could be “The Top 5 Things People Value When Purchasing Candles”. How easy was that? Quora is literally filled to the brim with questions and ideas that you can steal and make your own. If anything, Quora gives you a massive spring board to think of new ideas that are required to keep your blog floating. I use Quora all the time if I am ever stuck for ideas. It takes me just a few minutes and I find at least 5 new ideas for the future. If you are ever stuck for ideas, Quora is there to help and you are sure to quickly find something of interest. Use Answer the Public to find hot topics. To help you find the hottest of the hot topics, you will need Answer the Public. What Answer the Public does is it turns your keyword idea around and produces a whole stack of results that are based off what other people are looking for near your geographic location. You are given so many options and you are certain to get a few ideas from using this method. The best thing about Answer the Public is probably the way the results are presented. The results are shown in a visually appealing way which will help you find the ideas you are after even faster. You have the ability to build and grow all these ideas even further to truly make them your own. As well as this, you can export all the ideas off the website and onto your computer for later use. The questions are separated and grouped to help you find the right set of ideas. The great thing is most of the ideas are already in a headline format meaning you don’t have to make major tweaks. All you have to do is start writing! The sheer volume of results from Answer the Public is unbelievable. You will truly have high quality ideas coming out of your ears! The hardest thing you’ll have to do is choose which topic to write about first. Are the ideas flowing now? Hopefully they are! 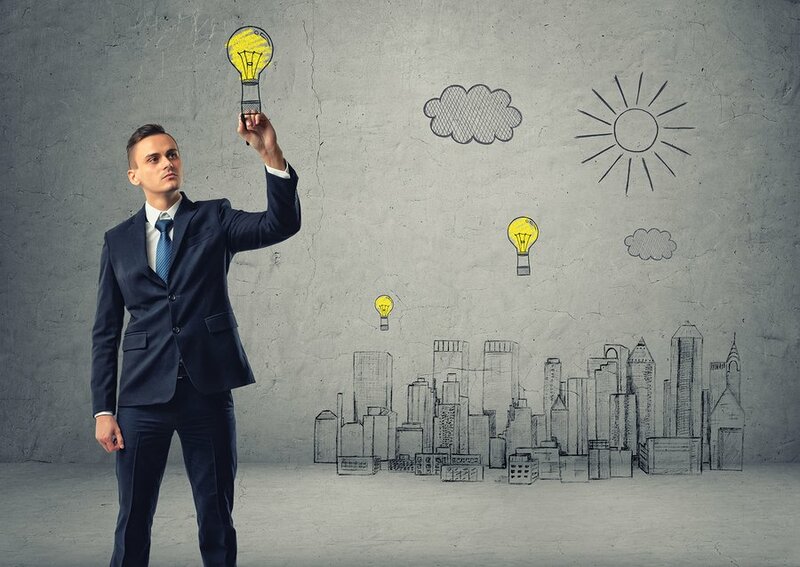 These are the top 4 ways to keep your ideas moving. I personally use all 4 of these methods and I literally have ideas for days. Even just using one of these ways will dramatically boost the amount of ideas you have. Rest assured, long gone are the days where you sit for hours trying to think of a great topic to write about. To keep your ideas flowing you should steal topics that are trending. To do this, take a look at BuzzSumo. They will give you the most shared articles based on what you search for. You should also use HubSpot’s Blog Topic Generator to get the creative juices going. Just input a noun can you’ll be given some great ideas. As well as this, to keep ideas moving along you should probably look at turning people’s questions into your own topic. Try using Quora to get some great ideas. Lastly, to find some of the hottest topics going around at the moment, jump on to Answer the Public. All you could ever hope for and more is on this website. Trust me, give these 4 awesome tactics a chance and you will never have to scrape the bottom of the barrel again! Do you have any more ways that you keep your ideas flowing? Let us know in the comments below! Read ➡ Is SEO dying?